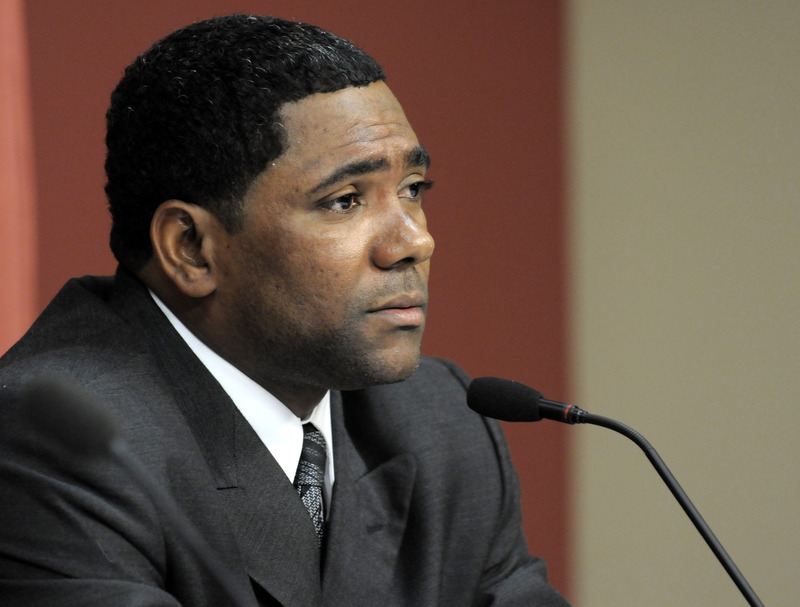 Houston Astros shortstop Miguel Tejada issued a tearful apology at a news conference in Houston on Wednesday, hours after he pleaded guilty to a misdemeanor charge of misleading Congress regarding his knowledge of steroid use in major league baseball. Tejada took no questions during the news conference at Minute Maid Park. Earlier in the day, Tejada admitted he lied to congressional investigators in August 2005 during an interview in a Baltimore hotel room when he said he was unaware of other major league players using performance-enhancing substances. Federal Magistrate Judge Alan Kay released Tejada on his own recognizance and ordered the player to appear in court for sentencing March 26. The maximum sentence for Tejada’s offense is one year in prison and a $1,000 fine, but sentencing guidelines are more lenient. Kay’s comment raised the question of possible deportation, but a lawyer for Tejada, Mark Tuohey, said the guilty plea should have no impact on Tejada’s remaining in the United States, according to the Houston Chronicle. Tuohey was hopeful Tejada would receive probation. Tejada’s legal problems stemmed from the congressional testimony of former Baltimore Orioles teammate Rafael Palmeiro, who told Congress in March 2005 that he never took steroids and during the ensuing season tested positive for steroids. Palmeiro then said his positive test might have been the result of a contaminated vitamin B-12 shot he said he had received from Tejada. Congressional investigators eventually asked Tejada about his knowledge of steroid use in baseball, and Tejada said he didn’t know of any players involved in steroids and hadn’t heard any such discussions. Meanwhile, former Oakland player Adam Piatt said in the Mitchell Report that he supplied Tejada with human growth hormone for a total of $6,300 when the two were with the Athletics in 2003. Although Piatt was not named in court papers filed by prosecutors, the criminal information document that outlined Tejada’s offense refers to a player supplying Tejada with HGH. Wednesday, prosecutors said Tejada contended he did not use the substance and discarded it and there was no proof to the contrary. New York Yankees third baseman Alex Rodriguez may be suspended for admitting he used performance-enhancing drugs, commissioner Bud Selig told USA Today. Selig and MLB officials realize any attempt to suspend Rodriguez would be challenged by the players association since the penalty phase of baseball’s testing policy was not implemented until 2004. Selig said he sent a memo banning steroids around 1997, and that it was illegal to possess them without a prescription. Right-fielder Bobby Abreu and the Los Angeles Angels have agreed to a one-year free-agent contract. Several media outlets reported that Abreu will be paid a salary of $5 million. Abreu, a 13-year veteran, batted .296 with 100 RBIs and 20 homers last season with the New York Yankees. Adam Dunn and the Washington Nationals agreed to a contract worth $20 million over two years, several Web sites reported. Dunn hit a combined .236 with 40 homers, 100 RBIs and 164 strikeouts last season with the Reds and Diamondbacks. The baseball players’ association decided against opening a spring training camp for free agents. The union held a free-agent camp in 1995 in Homestead, Fla., following a 7 1/2 -month strike. Because of the slower pace of signings this year, the union considered the idea again.